Suction Tub and Shower Bar 16"
We all know that, anywhere there’s water or trip hazards, there’s a higher risk for accidents. To prevent slips and falls in the bathroom, kitchen, hallway or anywhere else that presents risk, be sure to install some grab bars and support stools from Collections Etc. These safety products are specifically designed for elderly loved ones and those who may have mobility-limiting health conditions. They will surely help any individual with challenges feel more independent. 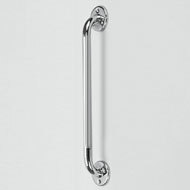 One of the best ways to lower injury risk in your home is to install bathroom grab bars. 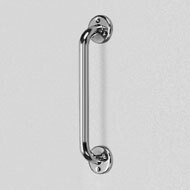 With an easy-to-install bath or shower suction grab bar, you or your loved one will be able to easily get in and out of the shower or bath with extra stability and confidence. We also have toilet safety products, shower seats and bathtub safety rails to prevent slips and falls in the bathroom. Browse all of these items for safety-enhancing solutions for many rooms in your home. Mount this sturdy grab bar vertically, horizontally or diagonally to give you a helping hand. Made of heavy-duty, chrome-plated steel with a textured, slip-resistant grip. Hardware included for easy installation. Size 16"L x 2 1/4"W x 2 1/2"H.
Mount this sturdy grab bar to give you a helping hand. Made of heavy-duty, chrome-plated steel with a textured, slip-resistant grip. Hardware included for easy installation. 24"L x 2 1/4"W x 2 1/2"H.